Branding is a fascinating world and I love to read about it, hearing everyone’s opinions and contribute whenever I can. 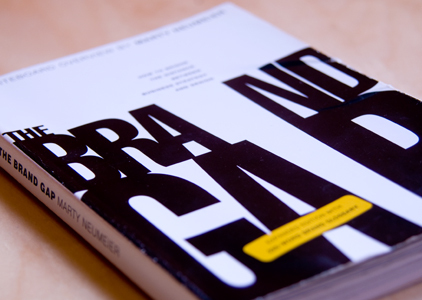 This slide show is a synopsis of The Brand Gap, a whiteboard overview, written by Marty Neumeier. It is clear, concise and a perfect introduction for those who want to understand what branding is all about and can be applied to any industry. For those reading this post from their iPhone or iPad, you can see the slideshow here. I love it because I finally read about a designer that doesn’t see design as an end-result but as a mean to serve a bigger cause. Branding is simply not about design. It is a combination of multiple tangible and intangible elements that creates an overall experience – a relationship between a product and a consumer. Design being only a visual representation of that relationship. I highly recommend The Brand Gap but please share on this post your own recommendations !